Over the past few years Trumpeter has produced practically every conceivable version of the Soviet KV heavy tank in 1:35 scale and is continuing that trend with the IS series. Anyone who has built any of these kits could probably attest to the fact that they are accurate and easy to build. As well as some very well moulded plastic parts this kit provides a turned metal gun barrel, separate track links and some etched brass for the air intakes on the top of the engine deck. The separate track links were welcome as this made it easy to replicate the heavy track sag between the return rollers which seemed to be a feature of these vehicles. 6. The drive sprocket was then glued permanently in position. I thought that adding a few scattered dead leaves might have been a good way to break up the plain green finish and that the best way to produce these would be to use real leaves. I chose some likely looking leaves from a maple tree outside my house which has great colours at this time of the year. After drying indoors for a few days the leaves were sprayed with matt varnish (which will hopefully stop them disintegrating as time goes on) and then maple and oak leaf shapes were made with punches from RP Toolz. These punches produce leaves in four different sizes. The largest were discarded as being a little too big for this scale, but the other three looked fine to me (as trees actually have leaves of different sizes). Punching them out of a real leaf produced leaves with slightly different colours complete with a few fungal spots – which is exactly the way they looked on the tree!! Each leaf was attached to the model with a dot of Testor’s Matt Varnish. This was an enjoyable project and I think that Trumpeter’s KV/IS series can be recommended to all fans of Soviet armour. 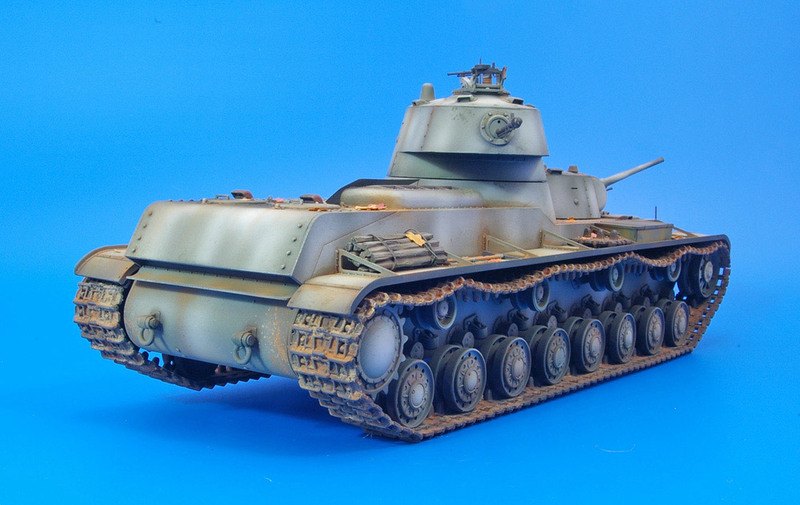 The subject of this project is Takom’s 1:35 scale SMK Soviet heavy tank. The SMK (named after the Communist Party official Sergei Mironovich Kirov) was one of a number of heavy tank designs that appeared in the late 1930s, competing to replace the T35 multi-turreted tank. I really enjoyed building this kit. It was a quick simple project that has resulted in a very large interesting looking model – in fact so large that I now have to find somewhere suitable to put it. The making of this triptych was not obvious since the concept took shape only after mounting the Tiger I and his crew. The idea is to build a diorama in three distinct parts to create an effect of distance, on the one hand, and a visual link between the skits, on the other hand. The kit is the Tiger I Late production w / Zimmerit from Dragon to which I have put the set #35B71 8.8cm Kwk 36L / 56 Tiger I (late model) from RB Model. Hope you like it! Gaishi S.
This model came about when I needed a model as a painting horse. It had languished in the attic for a good number of years part built. As it turned out it was not required and this led to it being finished. The build was as usual with a Tamiya kit straight forward but I decided to leave certain items off the build, Such as the rear mud guards, side fenders, the crane and the front light. Once all built and washed a primer was applied using Mr Surfacer 1500 grey . This was followed by Mission Models Paint MMP-019 Dunkelgelb RAL7028. A lightening of this colour came next to hit high spots and act as a soft modulation. The tools were painted as were the wheels and at this time the tracks were coloured with AK Track colour. A wash was next applied using a dark brown mix acrylic paint thinned with proprietary thinner, water and slow drying agent, applied along weld seams. Panel edges and raised detail and when dry cleaned up with a damp clean brush. Oils were then used to create streaks and to bleach the base colour giving the finish some life. The dot technique was used to filter the tank before another round of streaking was carried out. Chips were painted using Model Color 822 SS Cam Black Brown applied with a pointed brush and when dry some of these chips were touched in with a HB pencil to replicate worn steel. The pencil was used on the track links in a similar manner. A simple base was made up from Air dry model clay , small stones were pushed into the still wet material as was the tank to impress the track marks into the surface. The base was then painted black and the stones picked out in various colours. Brown colours were then sprayed over the base in various places and shades to ad variety. Model Railway grass fibres were then stuck in position and the whole was then stuck down to a wooden base. The tank was then added using PVA adhesive and pigments mixed with filler made up a mixture to act as a fillet and make the ground up to the tracks and when dry it was painted and a dusting of pigments applied dry and set in place with Tamiya X20A thinner blown through the airbrush at low pressure. I wanted to try out making tarpaulin and water and had just made the 2 half trucks and jeep. Having decided on the vehicles I would be using I decided to make the ground work fairly simple so the camp setting I believe was the best idea to go with. All the vehicles were built straight from the box with no additions and the figures are from a selection of different sets. The vehicles markings are also what came with the kits. Here is my Russian FROG 7 Missile System made from the Trumpeter 1:35 kit – hope you like it! My first model fully completed in a couple of years or so. There has been a few fall at the last furlong in my bid to get back into modelling but this lovely 40 year old Tamiya kit gave me the simplicity of build and quality of parts to finally get one done. Bring on the next. Many of you may have seen the superb work created by Sergiusz and he is in my opinion one of the very best armour modellers in the world as I type these words. No small accolade for sure and if you take a close look at the realism and level of detail, composition and finish on his pieces you will see what I mean. Many thanks to Sergiusz for sharing his most excellent work with us all. Geoff C.
I have long-admired the excellent figure sculpting work by Luc Klinkers and he has very kindly given us permission to include some of his excellent work here in your SMN Gallery. I think that it’s inspirational and each scene and diorama is full of ideas that you can use to help improve and develop your projects too. Sit back and just take in his work… most of Luc’s figures are sculpted and scratch-built with many others being modified. What’s so incredible is that Luc says that his tanks and AFVs are really just a backdrop for his figures! Thanks again Luc and best wishes, Geoff C.
This kit is a classic combination of mobile artillery. Not the greatest or most powerful gun in the German armoury but a real workhorse. The kit is a pleasure to build with lots of detail and options. As with all AFV Club kits, the quality is superb but does suffer from too many sprue attachment points needing some care in removing. The kit was painted using AK Interactive Panzer Grey Modulation set although I just used it for basic shading not the whole modulation thing. The base is one of my favourite kits, the MiniArt Italian Village Diorama. I really love these vac form kits and would like to do more of them in the future. Now here’s something special – Shall we pull that truck? By Wu Bayin. Would you believe that it’s 1:72 scale? Well, it is and such attention to detail… incredible work! Shep Paine inspired this diorama with one of his old Monogram diorama sheets and talking to him about how important a story is to a diorama. See if you can guess what the story is from the title. This diorama was finished 3 times. Once in 2004 for the annual Chicago Figure Show, again in June 2005 for Military Modelcraft International and again in November 2005 for my own satisfaction. Additions from the original finish were the additions of the soldier with the shovel, the soldier looking up, articulating the tank’s suspension, making new Sake arrangement and new palm leaves. The final additions were the addition of the saw in the soldier’s hand and wheelbarrow. The figures were converted from DML Iwo Jima Japanese figure set, Hornet heads and hands and epoxy putty. Groundwork and figures were finished using Vallejo acrylics. The Type 95 Ha-Go light tank is the same model that has already appeared on Track-Link. It was further weathered using Gamblin pigments, Rustall, Winsor/Newton water colours and Bragdon rust. Here is my Sdk.fz.140 Flakpanzer Gepard made from the 1:35 Italeri kit. The base kit is the Dragon Sherman III. I really liked the camouflage on the Shermans in Sicily. I’ve added the lower part of the Resicast deep weading gear. The suspension and .50 cal are from Tasca, as are the side skirts. The stowage is mainly for Resicast and the crew is from Hobbyfan. Finishing has been done with Tamiya Acryls and some weathering with washes and pigments. This Sherman is one of my favourites. And I think I’ll build another one in the future, only I’ll use the Tasca kit because the Dragon isn’t that great. This small vignette is built around the excellent Tamiya 1:48th scale kit M4 Sherman Early production with two figures added of a driver and commander from the Tamiya 1:48th WWII U.S. Army infantry GI set. The Sherman has been extensively detailed using the Hauler etched brass detail set and Hedge cutter designed for this model plus various scratch built details including many tiny bolt heads, an MV clear lens for the headlight and drilled drainage holes for all the armoured fittings, plus many other small details. The model was airbrushed using the pre shade and high light method with Tamiya acrylics and weathered using artists oils and various pigments etc. the figures, tools and details were painted with Humbrol enamels and citadel acrylics. Stowage on the model is from Tamiya’s 1:48th Jerry Can set plus tarp’s made from tissue, pack straps from lead foil and tie down rope from fine string. The base is made up from polystyrene blocks to raise the ground for the hedge row, some model railway cobblestone road sections, Polyfilla and crushed cat litter groundwork, woodland Scenics long grass and Fine leaf foliage for the hedgerow. This model won the IPMS Czech Republic shield/trophy for “Best Model of a WWII Allied AFV” at the IPMS UK nationals Scale model world 2005, plus several other competition awards. A coat of Humbrol matt cote was then sprayed over all. The Citroen makes a splendid addition to Tamiya’s range of 1:48 vehicles and looks just fine placed next to armour or aircraft. I made the Citroen up as a civilian car and sprayed the model with Humbrol satin black to give the car a drab appearance as it would have appeared during the war. The weathered chrome on the bumpers, radiator grille and door handles etc was achieved by dry brushing Humbrol no.11 over the satin black, together with some Karisma color silver pencil. The wheels and tyres were given a wash of thinned Tamiya flat earth acrylic. The registration plate decals fit perfectly. Two fine additions to my 1:48 armour collection. This is my Tamiya 1:48 Sherman project where I’ve converted the kit into a ‘Dozer using the Gas-o-Line conversion set; figures are from Dartmoor Figures and the stowage from Black Dog. This one is Dragon’s 1:35th scale Sherman Firefly. As ever, Dragon kits (especially the instructions) can be complicated, but the detail is good and the end result looks every bit a Sherman! This diorama consists of the Tamiya 1:35th Sherman M4 A3 105mm & Infantry figures, the figures are straight from the box except for added texture to the helmets and tape straps added to the weapons. The Sherman has some extra details added such as scratch built turret mounted MG stowage brackets, wire grab handles on the turret and hatches, stud and sealing ring detail for canvas cover added to gun mantlet, drainage holes drilled to all fitting housings, etch chain added to filler caps, stowage retaining board and brackets to front, bolt detail to suspension and many other small details. The ruined church, telegraph pole and gate section are all Italeri diorama accessories; the hollow church ruin has been filled with Polyfilla + cracks/bullet holes added with a knife, the telegraph pole wires are made from fuse wire. The scene was built up with Polyfilla etc. sprinkled with static grass and painted before adding snow, a mixture of Woodland Scenics Snow, bicarbonate of soda and crushed alum powder to add sparkle. Snow was applied with a tea strainer onto the base and fixed with odourless hairspray. This Sherman is the old Italeri kit, I built it straight out of the box. It is painted in Life Colour Acrylics olive drab set. I started with a base coat of olive drab then mixed up a darker shade adding some black to the paint and added it all around the panel lines and details. I then used a lighter shade of olive drab to highlight the inside of the panels bearing in mind I always use the original base colour in the mix so as it all ties in together nicely. When the paint was dry (in minutes with the hair dryer) I laid on a couple of filter coats with Mig productions filters. This was followed by a pin wash around details with Mig’s dark wash. I hand painted the vehicle numbers and its name (Bettsy). I left the model to dry for a couple of days and then added various thin washes with diluted Mig powders around details. I varied the colour for added interest and realism. Wire camo mesh was added and various stowage. The figure is from Verlinden and is painted in Vallejo acrylics. This model is the Hobby Boss 1:35 Soviet T12. The T12 and the similar T24 appeared in the early 1930s. These vehicles were home grown designs following on from the T18 which was a copy of the French Renault light tank. The designs were not particularly successful though the chassis was used as a basis for an artillery tractor which saw service in the Second World War. Period photos of the T12 are few and far between. However, the ones that I could find suggest that the vehicle may have existed in several forms. Some seem to have had exhausts on both sides of the rear hull while others had an intake on the right-hand side of the hull. Drawings published on the internet also show different layouts for the engine deck. I am therefore unable to attest to the accuracy of the Hobby Boss kit. Nonetheless it was fun to build and was used as an experiment for applying dust over a coat of hairspray. A few dead leaves made with punches from RP Toolz using actual dead leaves from the garden. The leaves were sealed with matt varnish before being used. Here is Paul’s excellent Soviet T-55A looking the worse for wear! Great modelling skills here like the realistic cast texture on the chassis and turret, not to mention his rust work – all very authentic-looking for an abandoned vehicle of the period. Nice work Paul! I think that in the aviation world there is a saying along the lines of ‘if it looks right then it will probably fly right’. While they don’t actually fly around very much I think that this may relate to the world of armoured vehicles as well. Even by the standards of the first armoured vehicles to be developed the St. Chamond didn’t really look right and didn’t perform very well either. The basic design flaws seem to have been the short length of the tracks in relation to the overall length of the vehicle and poor weight distribution making it liable to tip forwards and become stuck when travelling over rough ground. This model was made from the Takom 1:35 (Early Type) kit. This was very easy to build though a great deal of care had to be taken with the suspension which is (like the full sized vehicle) complex and fragile. Most of the time spent on this model was taken up with painting. The model was first primed with Halford’s plastic primer straight from the rattle can. The spray painting was done using Tamiya paints. I searched the internet for colour references as there seems to be some conjecture as regards the actual colours used and as period images don’t really help much the colours I’ve used may be a little off. The main colours were masked and sprayed while the dark stripes were brush painted using Black / Grey from Vallejo (I find that these paints lend themselves well to brush painting). I did not use black as recommended as I find it too harsh and it looks a little ‘out of scale’. The colours were toned down with dots of oil paint blended into the paintwork and a light overspray of Tamiya Khaki. While mud may have been a major feature of life on the Western Front, I’m not a fan of splattering it all over my models and so weathering was restricted to thin pigment washes on the tracks and a dusting of browns / buff with the airbrush concentrating on the suspension. I discovered that the bar at the front of the vehicle was in fact a wire cutter. To make a feature of this I constructed a piece of home-made barbed wire. Two or three lengths of fine wire were twisted together to make a ‘rope’ before knotting more wire around this at intervals to make the barbs which were fixed in place with superglue. Those with an interest in barbed wire (I know you’re out there because there is actually at least one magazine devoted to the subject!) will probably complain that this does not look exactly like the wire used on the Western Front at the end of the Great War, but it looks close enough to me. All in all I think this is a great kit that can be recommended to all fans of early armour. Here is my Sturer Emil in 1:35 scale. A ‘what-if’ but an interesting subject. A bit of renewed life for an old kit and really a weathering exercise? This is my completed SU-100 in 1:35 scale made from the Dragon kit. There is a lot of weathering and special effects on it mostly created using AK and Mig weathering products. Here are the pics of my model – the Tamiya 1:48 SU-122 with some Black Dog resin accessories. This is a 1/35th scale model of the French UE tractor, some 6000 were captured by the Germans after the fall of France. They were used as munitions panzers, police and airfield security duties mounting a 7.92mm MG and as a light Pak carrier. The model is of the latter, consisting of the Maquette kit of the UE carrier built straight from the box with the Tamiya 37mm Pak 35/36 mounted on top of the superstructure. The tracks are link and length and a little fiddly to fit. The carrier was completely assembled and then undercoated with Halfords grey matt primer. The Pak was assembled without the carriage or wheels and then primed. Painting was done with Tamiya paints cut with cellulose thinner starting with the sand colour. This was then over sprayed with green and brown roughly 1/3 area coverage of each colour. The gun was done in the same way. A light coat of the base was then over sprayed on the upper surfaces of the carrier and the gun to help tie the colours together and tone them down. The lower part of the carrier was sprayed with dark earth tones. A pin wash was applied to all raised items such as nuts rivets, louvers and grooves. When this had dried a light shade of the base was dry brushed over all raised items. The wash and the dry brush give depth to the finish. The track and breach were painted gun metal then dry brushed with silver and this was followed with a wash of very dark brown. A simple base was made from a piece of conti board cut to size and iron on edging strip used to edge it. Obechi was used to form an inner frame to hold the groundwork which was made from a plaster based filler. This was smoothed out and when the plaster was partly dried the carrier was pressed into the surface to imprint the track marks. Once dry this was covered with pva and green flock spread over, pressed down and then blowing across the surface the flock stands upright. The wall was made from a plaster casting sealed with water and pva mixture brushed on and allowed to dry. Small bits of various items were then used to represent weeds, shrubs and dead tree. The grass was painted in various shades of green and drybrushed with a pale yellow. The wall was painted in grey and brown tones followed by a wash of thin black and brown colours. The various weeds were again painted in greens, browns and yellows. The carrier was then stuck to the base with pva and left to dry. A nae plate wasmade from a piece of plastic card to which a computer printed label was stuck. This was then covered with some self adhesive clear plastic book covering. JOB DONE. This is an old kit which has been now released as the French carrier with tracked trailer by Tamiya. This is a small vehicle and builds into a nice model of something different to the normal tanks and softskins. An easy build straight from the box and with the added Pak it turns it into an interesting subject. This proves the point that you don’t have to spend a fortune or build something large to get a nice model subject that has interest which will grace your collection.